Velocity relative to what? There's no central universal point to measure velocity at, so your answer is likely going to change based on your frame of reference. This is equivalent to a C3 (Characteristic Energy) of approximately 164 km2/s2 (Source). But, Voyager 1 is leaving the solar system faster (despite launching at a slower velocity), due to the dual gravity assists it recieved from both Jupiter and Saturn. As of January 2015, it was travelling at 17.027 km/s relative to the sun (Source). Of course, we aren't done here. The solar-studying Helios Probes, achieved a maximum velocity of 252,792km/h (70.22km/s) (Source) as they passed perihelion in their solar orbits. So do you consider this the record? As the probe passes around the Sun, it will achieve a velocity of up to 200 km/s (120 mi/s) at that time making it the fastest manmade object ever, almost three times faster than the current record holder, Helios II. The point I'm trying to make it's all relative man! I hope this answers your question. 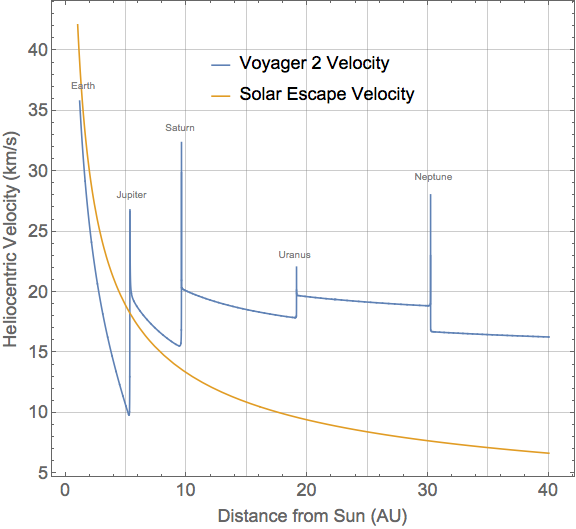 EchoLogic's answer is great, and I like the chart of Voyager 2 because it shows escape velocity. But there's a few different approaches (maybe I should say, points of view, from a layman like me) that can be used, for example, the Earth orbits the sun at 30 km/s (67,000 miles per hour), so any object leaving the Earth's orbit, even if it leaves the Earth ever so slowly, like let's say, it climbs a space elevator and then is given a push, just enough to escape Earth's gravity - that object is already traveling at 67,000 miles per hour compared to the Sun (and it's a good thing, if it wasn't, it would fall towards the Sun). So, 67,000 and 0 can be used for the same ship; which do you use as a starting point? Fastest velocity relative to Earth can be a kind of cool indication of launch power and improved engine design and all that, but velocity relative to Earth isn't that interesting once an object is outside the Earth's orbit. Then velocity relative to the Sun is usually used. I think a better, truer but less traditional measurement of velocity would be ship velocity minus orbital velocity at that distance from the sun. Ship velocity minus escape velocity also works as a measurement of the ship's final speed as it gets far from our solar-system, but the cool thing about ship's velocity minus orbital velocity is that it tells us how fast the ship is moving relative to what it's close to. 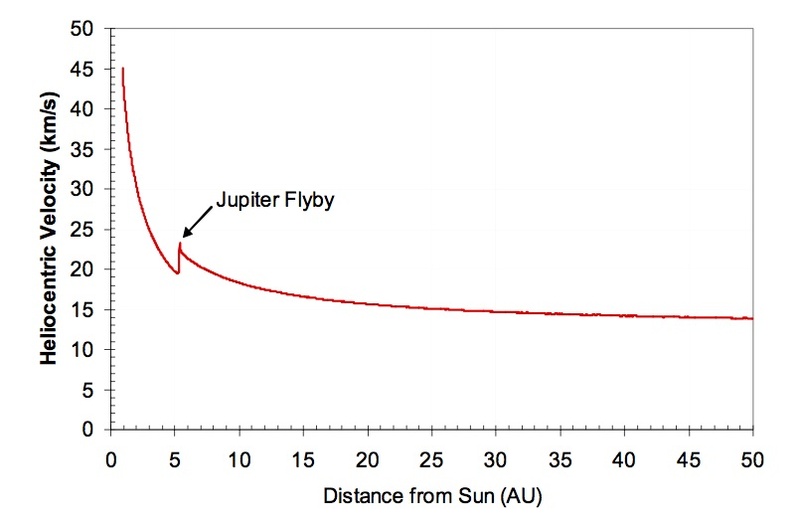 For example, for the recent Pluto fly-by, the ship was traveling far too fast to do anything other than a fly-by, but on the Messenger journey to Mercury, Messenger had to match orbital speed around Mercury, so, relative to orbital speed around the Sun, it was traveling quite slowly for a ship. It's all in how you look at it, but I personally like velocity relative to the Sun minus orbital velocity at that distance from the Sun for solar-system travel and I like velocity minus escape velocity for travel outside the solar system, which in a practical sense, hasn't really been done yet. Not the answer you're looking for? Browse other questions tagged spacecraft interstellar-travel pluto travel or ask your own question. Compounds causing the various colors on Pluto's surface?